The team at Nomad has long been fond of a sour mash. It was a noted feature when their saison first came out through to the release of Freshie, the salt & pepper gose which earned a place in our best new NSW beers of 2015. But 2016 has seen them hit puckering new heights when it comes to sour beers. Most recently there has been the Wild Mongrel sour ale made with Shiraz grapes and Without A Paddle, their grape laden GABS entry and punny take on the Belgian kriek style. This beer is, if you couldn’t tell from the name, the Brookvale brewery’s interpretation of a Berliner weisse. What that translates to in real terms is a pretty traditional barley and wheat malt bill with a bit of lactobacillus lumped into the mix. 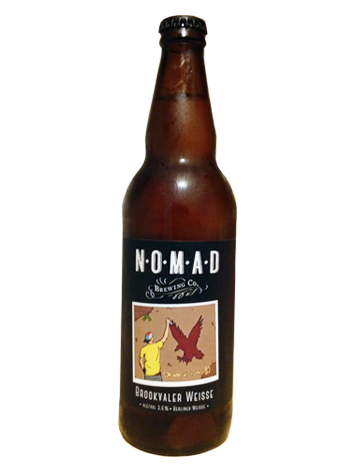 But with Nomad adding something unusual to pretty much every one of their beers, this one also comes with added lemongrass. Working off the light malt base the citrus flavours it imparts run rampant and take precedence over the sourness, together helping to form a very dry and exceedingly refreshing beer. It's the sort of beer that would be an ideal refresher in the warmer months but also works as aperitif and cleanser before and during a hearty winter meal, particularly considering it clocks in at just 3.6 percent ABV.